How did Pannell turn into Pannill? There are many Pannells in the United States, but only a hundred or so Pannills. Family stories explain the spelling of Pannill – stories being the purpose of this blog – but only recently I found confirmation in DNA testing. One of my father’s five sisters (I can’t remember which) told me our ancestors adopted the surname Pannill in the 17th century. According to her story, three brothers named Pannell had fought in the Royalist army during the English Civil War (1642-51). The war broke out between Parliament and King Charles I in 1642. The war ended with the king’s execution by beheading at the instance of Oliver Cromwell, the Lord Protector. Perhaps that was Thomas Pannill. His birth took place in England about 1623, according to the records at Ancestry.com. He would have served in the King’s army in his early twenties. He died in Virginia in 1677 at the age of 54. Family oral history holds that Thomas and brothers arrived in Virginia in 1648, which would have been his 25th year. The aunts believed Charles II granted him land along the Rappahannock River in Virginia to recognize his service to the Crown. I never have tracked down the story of the land grant. But in the 18th century, William Pannill III did establish a farm, “Green Level,” near the Rapidan River – a southern tributary of the Rappahannock in Orange County, Virginia. Spelling was chaotic in the 17th century. One scholar finds 20 different spellings of the name “Shakespeare,” for example. And the sources refer to Thomas Pannill – born seven years after Shakespeare died – as Pannill, Pannell, and even Pinnell. But the “i” spelling took hold among Thomas’s descendants. Ancestry shows he had a son William “Pinnell” or Pannell in 1653 in Richmond County. Thus would probably be the first William in a long line. William died in 1716 in Richmond. A few years ago the book Seven Daughters of Eve, by Brian Sykes of Oxford University, caused me to have my DNA sequenced. A day or so after an upgrade (on sale), I received an excited e-mail from a woman in Tennessee. You are the first DNA match that shares a surname of my family. 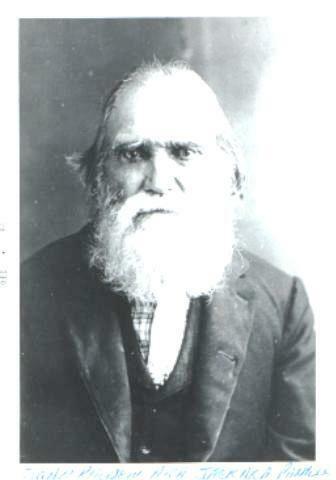 My gr gr grandfather was Andrew Roden, b-1830 in Monroe Co., TN. His father was Littleton Pannell, out of Fairfield, SC. His mother Sarah Roden and Littleton never married even though they had 6 kids together. Some of Andrew’s brothers took the Pannell name when they left home. Most notably, John/Jackson Roden/Pannell. John flipped back and forth between names, committing bigamy all over the US and fathered many children before coming back to TN to die. He is buried in Ball Play Cemetery, next to his long suffering first wife, Betty Frye. Do you know about Littleton? His father was Anderson Pannell, also of SC. He used John Roden (his given name) when he was forced to serve on the Confederate side. Then he deserted and signed up with the Union under Jackson Pannell. His father was Littleton Pannell. This DNA match connects the Pannills with the Pannells and Rodens. Like us, they descend from a Thomas Pannell and a few Williams. Only problem is, their Thomas Pannell’s birth occurred in Virginia in 1677. Ours occurred in England in 1623, with his death in 1677. Perhaps “their” Thomas was a son of the soldier Thomas — or of one of his brothers. All the same, the most telling part of the Pannell-Roden family tree is not the name “Thomas.” It is the name of Brenda’s great-great-great grandfather – Littleton Pannell. He bore the name of the ancient village of Littleton Panell in England. That tells me that at Littleton’s birth – 711 years after Domesday Book – his parents named the child for the village of Littleton Panell. Why would they do that except to honor a family connection passed down through the generations? Like us, the Pannells-Rodens must have maintained an oral family history. I think the name Littleton suggests that the Pannells and Pannills in Virginia all originated in Littleton Panell, England, more than 900 years ago. One Response to Are Pannills really Pannells?